Acrobat Music’s series of British Hit Parade collections has become an essential annual purchase for a significant number of collectors and enthusiasts who wish to hear and own every record that entered the British record charts during each year. In the last two years, we have presented parallel collections to the main British Hit Parade releases for 1960, ’61 and ’62 comprising the ‘B’ sides of all the tracks that appear in the main set. The experiment has proved successful, and many collectors have asked us to work backwards through the years to provide similar sets for other years. This is the next in the series. 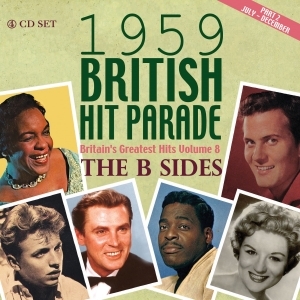 Part Two includes the original ‘B’ sides of every record that entered the charts between 1st July and 31st December in chronological order of chart entry, mirroring the tracks on Part Two of the main 1959 British Hit Parade collection, with well over three hours of eclectic and fascinating entertainment. The only exceptions are where the original hit was a double ‘A’ side, where both sides charted, as a result of which both of the tracks appear in the main Hit Parade collection. It also includes the tracks from Side 2 of EPs which charted. The story of how ‘B’ sides come to be what they are is a fascinating one and varies greatly from record to record. Some featured songs that were written by either the producer, the artist’s manager or someone else with sufficient influence to ensure that if the ‘A’ side were a hit, they would collect 50% of the publishing income from the sales. Others were, of course, complete throwaways, dashed off in the last 10 minutes of a session purely as make-weights. In contrast, some started life as the intended ‘A’ side, only to be overshadowed as promotion people or radio DJs spotted the potential of the ‘B’ side. The fascination is that, in most cases, with the passage of time, we will never know the true story, and the tracks will simply stand to be judged on their merits or otherwise. Whatever the case, they will very often provide collectors with a piece of the artist’s work that they have never heard before, and the majority, we suspect, will never have been available on CD before. The sets as always include our substantial booklets comprising about 10,000 words with commentary on the tracks. We are sure that many purchasers of the main sets will be keen to acquire the ‘B’ sides to ensure the completeness of their collection.